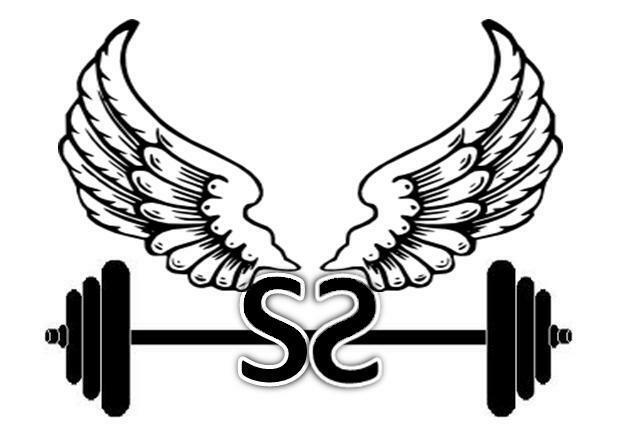 Want to show the world you are serious about improving both Strength & Speed? Want to defy what others think is possible by being both strong and fast? This criteria will help you set goals to achieve your best possible physique and fitness levels. You qualify for a strength score and a speed score separately. The max for each is level 10, which results in a max overall level of 20. Both levels must be obtained within 5 years of each other. Strive for the ultimate goal of Level 20!! Your display name will be posted on the Facebook page and website for bragging rights. As the organization expands long term plans involve sending out a quarterly newsletter that includes discount codes for products from other companies and a calendar to coordinate races between team members. Do I have to qualify at one level to move to the next level? No, you can jump straight to 10 if you can achieve those goals. Do I have to meet every requirement on every level? No, you just have to meet one requirement on each level. Do I have to re-qualify every year? No, when you achieve a level you have received that accomplishment for life. Can I use race times or lifts from a couple of years ago? Since this is new, we will accept older race times/lifts as acceptable. For race times it must be verifiable on a web site or results .pdf file. For strength achievements there must be proof via website results or video (Level 1-5 Strength is based on the honor system and does not require proof). Both your strength score and your speed score must be achieved within 5 years of each other. How do I join the team and register my score? First, go the online store and purchase either "Join the Team" or "Join the Team + Members Only Shirt". Join the Team is $10 or you can buy the shirt and get free entry to the team. This will get your display name posted to the website and Facebook page for recognition. Do you want your videos/pictures to be posted to our website/Facebook page? 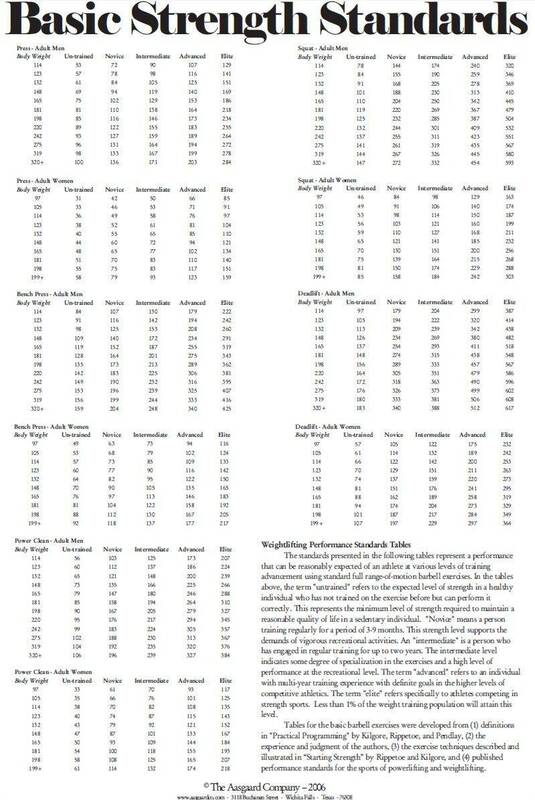 Strength Requirements and Standards for Strength Score (max score of 10). For levels 1-5 the honor system is accepted. If you are telling me you are level 5, I will accept it without proof. For levels 6-10 video proof is required or a link to a website that proves your claims (i.e. the results of a bodybuilding or powerlifting competition). Do my lifts count if they are done not in an official competition? Yes, however they must be to standard lifts. For example, bench press must touch the chest, deadlift must be from the floor, squats must be to parallel or below and it must show that you are not being assisted by a spotter. Can I wear wrist wraps, knee wraps, bench suit, squat suit, weight belt, lifting straps, etc.? Yes, those are all authorized. Do I need to show my weight on the same video that I send in my video of the lift? Ideally yes, if you are filming your lifts after reading this, then please show your weight as proof. For older lifts, we will accept the honor system, however if you look like you are 220 lbs. don't try to claim 165 lbs. 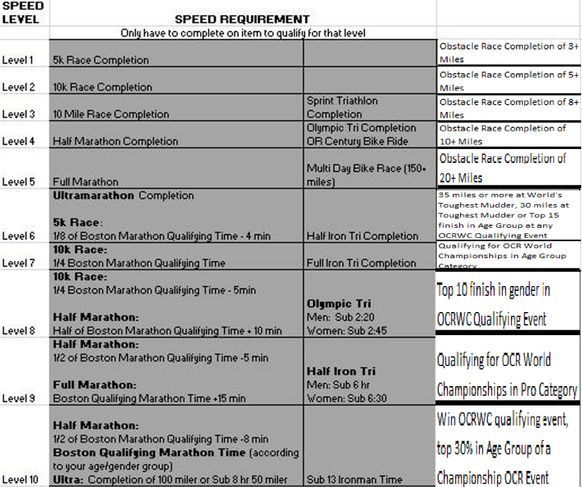 Speed Requirements and Boston Qualifying Times for Speed Score. 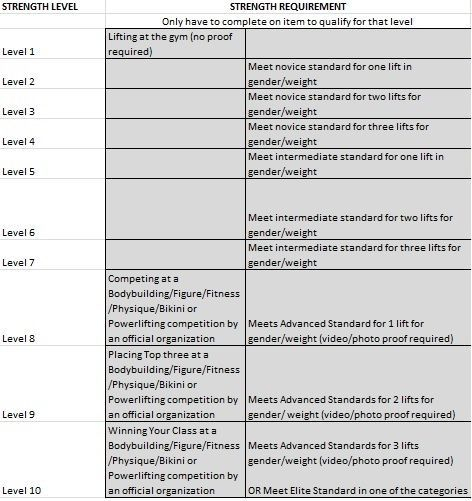 Click here for OCRWC Qualification Standards. Only actual races count for the speed standards. For proof please send link to the race website that shows your finishing time. Training runs do not count even if they are verified by GPS watch. Proof of finishing time and/or finishing the event is required for all levels. 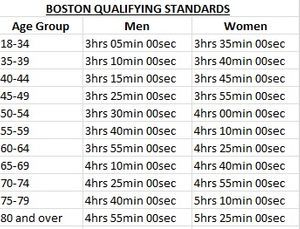 If Boston changes their qualifying times, then our standards will also change. What if I have an endurance/speed accomplishment that is not listed here but is very impressive? If you feel that your race or type of race was overlooked please email us at evan@teamstrengthspeed.com and we will look at your case to consider adding it to the list. If it passes, you will be granted the level deemed appropriate for your age/gender/race type and distance. BOTH SCORES MUST BE WITHIN 5 YEARS OF EACH OTHER. Sign up for an OCR today via the images above and below and start qualifying for your Strength & Speed score! Fuel up for success. 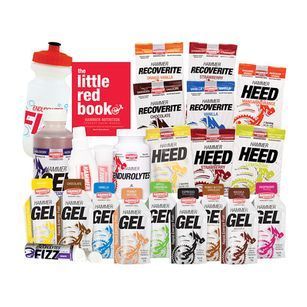 15% off your first order from Hammer Nutrition use ref # 240887 at checkout.